The pro-Khamenei website, Shafaf [means Clear!] claims to have further information on Abbas Ghaffari, the man claimed to be Ahmadinejad's exorcist who was arrested last week. The article includes a photo of him and a handwritten letter to his friends which Shafaf article suggests is Ghaffari's own handwriting. The article then continues by quoting the unknown recipient of the alleged letter, that Ghaffari became a Satanist in the city of Ahvaz, doesn't say when, and learned his witchcraft from another satanist in six months. Mashaei's circle, now referred to by Khamenei supporters, as the "deviant current" within the government, are supposed to have consulted Ghaffari on a range of issues which included fortune telling and government policy advise. If being a satanist, child of a prostitute and a ransom collector parents whose brothers and sisters were thieves and prostitutes was not enough ammunition for character assassination however, the article throws in just one more accusation by the unknown friend, just for good measure. Abbas Ghaffari, the sorcerer pretends to be a Muslim, claims to know the Koran and other holy Islamic texts by heart but he is Jewish and wears a star of David. How loyalties quickly change in the Islamic Republic! which begs the question, the Green Movement leaders - called Seditionists by Supreme Leader's camp - have been accused of not having the adequate "insight" by the Supreme Leader, what insight does the Supreme Leader then have, when he has backed these satanists and sorcerers to run Iran for the past six years? What a biography. Fascinating stuff. To be honest I am not sure whether to laugh or cry. Yep - 'He's a Witch!' Now Khamenei's cowardly clowns even HAVE TO contrive utter lunacy to get rid of his enemies! Tut! What a sad sorry state for Iran to be in eh? Still, with Syria in turmoil and the currupt cheating IRI finally turning on each other, surely the time must be brewing for Iranian's to march en masse again? The cracks are fast becoming chasms. And the pin on the granade has been pulled. So how much longer do 21st Century Iranian's allow themselves to be ruled by 14th Century lies, crimes and utter power crazed gobi desert lunacy? I love watching these dogs attack each other. Let them fight each other until their own demise. 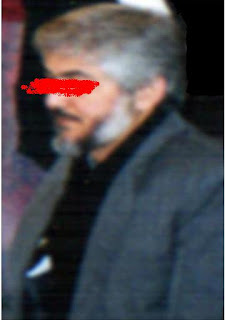 The photo is of Hamas leader Khaled Mashaal. No?